Wormhole diving and habitation seems to have gotten reasonably popular. Mostly I’ve been trying to acquire what I think are some of the requisite skills to make a go of it with my two accounts. While I’ve been acquiring all those ancillary skills that would allow me to be fairly independent (as well as able to defend my territory), I’ve been doing some wormhole diving getting my routine down. For a mostly-mission runner rock miner player like myself, its been a bit of change of style. Fortunately, my primary explorer character has covert ops which makes exploration fairly painless, though not without its occasional moments of terror. After experimenting a bit, I seem to have struck a good balance using 4 Sisters Core Scanner Probes in my expanded probe launcher. I’m using the Tech II Buzzard with Gravity Capacitor Upgrade rigs so resolving targets with my mostly all 4 scanner skills isn’t too time consuming. I tried using 5 and 7 but I found it to take a bit more time than managing and moving 4. Wormholes tend to be fairly strong signals as it is, so I seldom have to reduce the scan radius below 1 au to get to 100% scan strength. Wormhole diving has forced me to work on my remedial directional scanner education (something that high sec miners and mission runners can successfully avoid almost entirely after the tutorial). I’m getting fairly efficient in D-scanning down POSes I find in wormholes. With the 14 au limit on the D-scanner, I’m getting used to checking out the layout of a w-space system as soon as I enter it to see if there are inhabitant. Most of the time (but not always), the entry wormhole pops you relatively near the inner solar system. 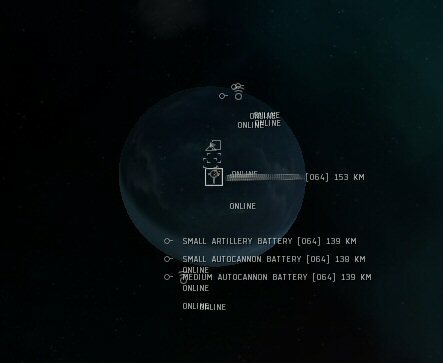 Hence, a quick 360 degree D-scan tends to cover most of the system and lets you know if there are any ships or POSes in the system. Of course, if the system is a bit far flung or your entry point is askew, a quick visit to the far sides and a D-scan will let me know if there are inhabitants. And inhabitants (and former inhabitants) a-plenty there are. Over the course of the last (casual) week, on my scanning runs, I’ve probably scanned down probably 20 wormholes. Of those, most have been Class 1 or Class 2 (my desired target). But of those 20, I’ve probably only seen 2 or 3 uninhabited systems. In addition, I’ve come across three abandoned POSes. On my last scan for the night, I also came across a vertiable wormhole city in J163138. Its understandable why too. That Class 2 system has a pulsar effect that adds 44% to shields. 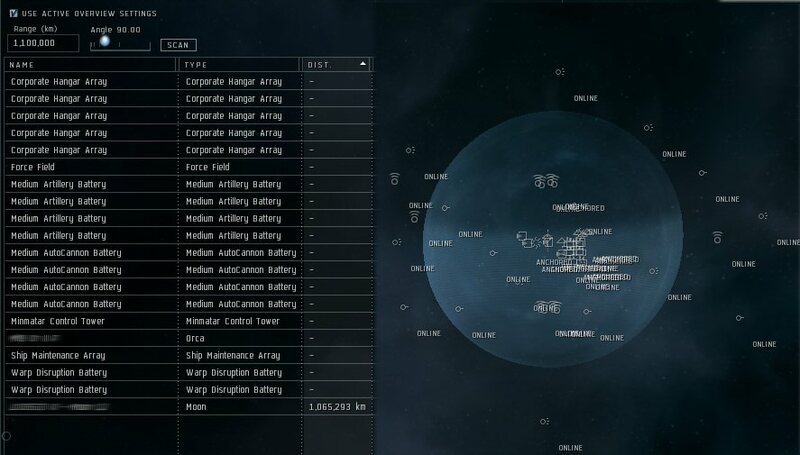 Caldari shield tank heaven. As soon as I warped in, I saw my shield “deficit” begin to fill up. 44% is an ENORMOUS boost. No wonder there were several towers, ship manufacturing arrays, many many hangars, etc. I didn’t stay long. Initially, when I would see a Control Tower show up on the D-scan, I usually just exited the wormhole and looked for the next one. Like a noob, when I saw a Control Tower on the D-scanner, I immediately assumed “inhabited” and bailed out. Of course, if you don’t see “force field” on the scanner, then its abandoned or out of fuel. Part of my basic routine, after ALWAYS BOOKMARKING THE EXIT WORMHOLE (which I’m sad to say I don’t remember to do 100% of the time) is generally to locate and visit any POSes which might be in the system. Caveat, I do this in a T2 covert ops ship cloaked so there is relatively little danger. So far I’ve only run into (literally) one warp bubble and there was nothing to decloak me nearby, so I just motorboated away and went about my business. Seems I’m not the only one confused about POS design…. Clandestinely visiting all these POSes is certainly giving me a bit of perspective. Given the wide range in organization and sophistication (or lack thereof), I’m feeling more comfortable about my general approach. Still, I’m realizing that the hardest part of wormhole habitation may be actually finding one to live in! I nearly pulled the trigger today even though I’m not entirely ready with skills and materials. My goal for initial deployment is to try to find a wormhole to live in with an entrance within one or two jumps of my primary staging system to facilitate logistics. Taking the advice of other bloggers, I’ve also been looking for a wormhole within a wormhole rather than one directly accessible to hi sec in hopes of finding one unpopulated, but alas, I only seem to find them during the week and past my bedtime…. I had scanned down about a dozen wormholes on Saturday (admittedly not a good day to find solitude in W-space) and finally found a fairly toothsome Class 1. I wasn’t planning on Class 1 for a number of reasons. First, you can’t get anything bigger than a battlecruiser through the entrance. Second, the loot isn’t that good. Class 1 meant no Orca which means major logistics and lower mining efficiency. Still, a week or two in a Class 1 would let me get my feet wet in the shallow end of the pool. Of course, I had planned everything for an Orca-enabled initial deployment (and no corp mates were online of course) so I decided to reorganize to fit everything in ordinary haulers. So, lessons learned. I’m now reasonably prepared to deploy in a Class 1 if I need to. I should probably not even consider it during the weekend because of the risk. The more diving I do, the more comfortable I am in navigating W-space, looking over my shoulder, etc. I was telling my wife, its a bit like swimming in the ocean. At first it can be terrifying when you consider there might be sharks, but the more frequently you do it, the more aware of your surroundings you become and while not risk free, it certainly become much less terrifying as you become acclimatized. Possibly probing in a deserted area of high sec might help. Aridia or somewhere like that might be good because no one is there so people may not scan down a wormhole that exits there. Don’t forget that as from Weds you’ll be able to farm the planets in your wormhole too. They count as nullsec and you’ll probably be the only one farming them. I think you’re right. I’m going to just have to bite the logistical bullet and expand my search a bit. Tyrannis was one of the reasons why I kind of wanted to get set up before this week, but there’s always something more to do by way of preparation. Started playing Eve about 6 weeks ago and pretty much a explorer at heart. Found your blog a while ago blog hunting and find it a excellent read and matching my exploration. So far in game really love scanning and probing down cosmic signatures. Have found several WHs in high sec since I live there at the moment however never jumped into a WH going to unknown space due to all the logical reasons why not to. Have yet to get Covert Ops training also but in 4 days will have it and can start exploring WHs. Im more facinated with a possible future in WH space that worrying about null sec. Wondering though how much does it cost to set up a POS in WH Space?